CHARLENE! Did you hear that? 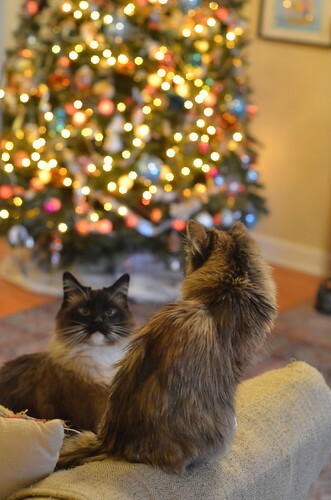 Was that the sound of sleigh bells? Could it be...? Could it REALLY be Santa???? 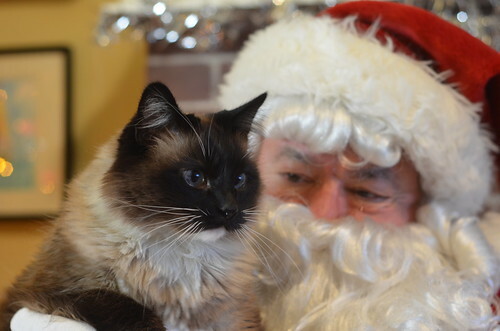 We just happen to know Santa Claus, and even though he's quite busy this time of year, he managed to make room in his schedule to visit our good little cats. 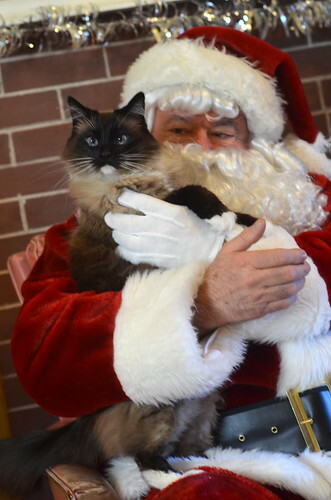 So, on Friday afternoon, he came by to say hello and hear their Christmas wishes. 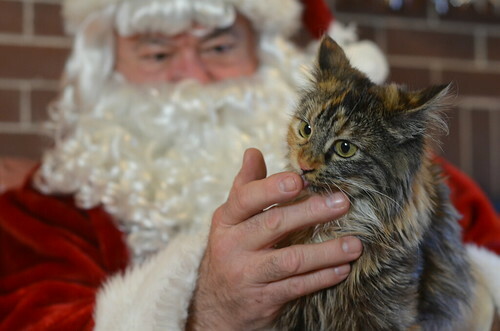 Santa is very wise, and knew that a tall man with a big red suit, and a giant beard might be a little bit scary for a tiny cat, so he just sat down and invited Wylla to play. After some time, he scooped her up and held her. Wylla was a wee bit timid and unsure at first. 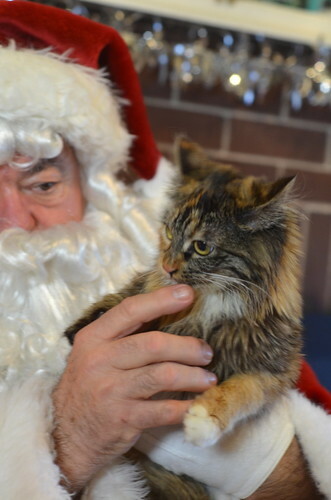 But after Santa gave Wylla a treat, she relaxed a little bit. Much to my surprise, Charlene took to Santa right away. Normally she's a little uneasy around strangers, but she seemed comfortable in his arms. Because she was so good, Bean got a treat, too! 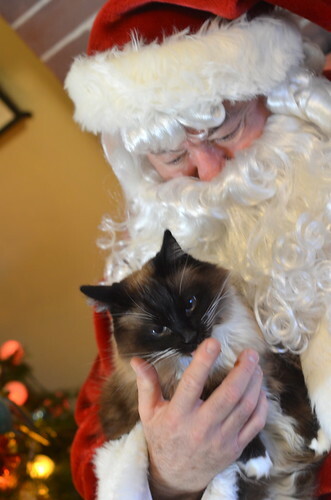 Santa is a huge lover of cats, has many of his own, and understands them well. He knew just how to win Wylla's trust. So, he got down on the floor with more treats and toys and they spent some quality time together. 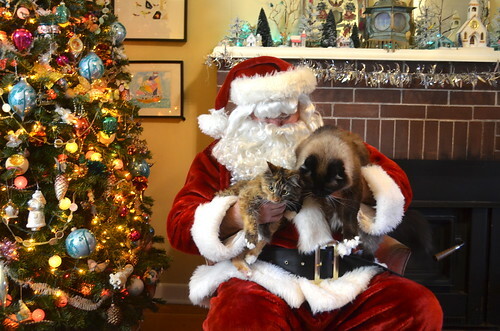 The girls had a great time, but I think I may have had even more fun watching Santa roll around my living room floor, playing with my cats and a catnip candy cane. And after the play session was over, back to the chair they went to finish up the photo session. And we got a few good ones for the family photo album. 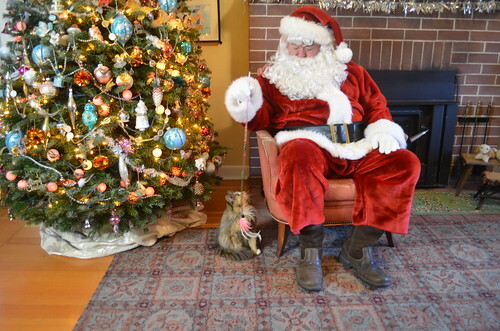 Thank you for visiting us, Santa Claus! Thank you for these sweet Christmas memories - we will cherish them a lifetime! 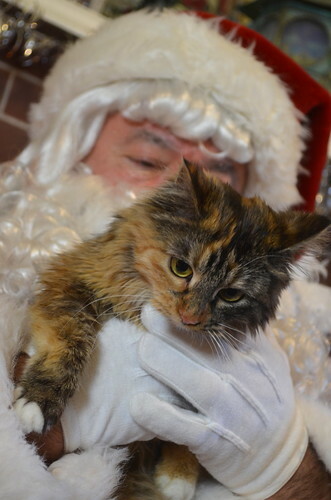 And thank you to Mrs Claus for the awesome bag of treats for humans and cats! You're a special pair, and we appreciate you greatly! Thank you for making our Christmas so merry! 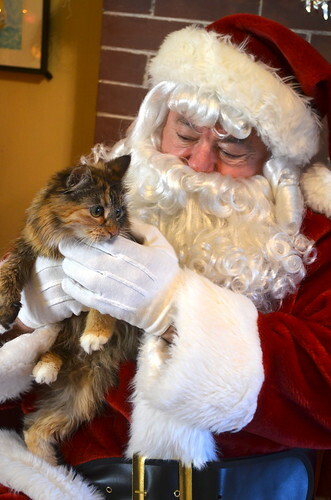 PS Because I know someone's going to ask if that's THE Kitten Whisperer in a Santa suit, I 'll tell you now that it's not. 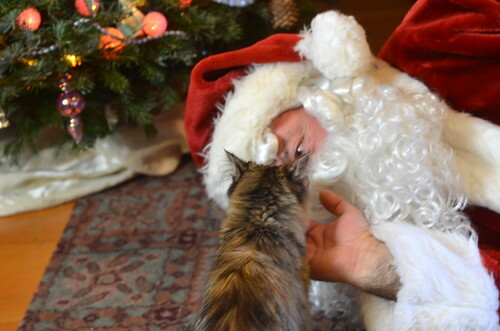 Yes, Santa has some awesome kitten-whispering skills, just like my dad does, but that's not my dad. My folks don't arrive until later this week. I'm not surprised Mr. Claus paid you a personal visit. You do such good work for cats and kittens. My favorite pic is the one with Charlene looking up at Santa holding Wylla. 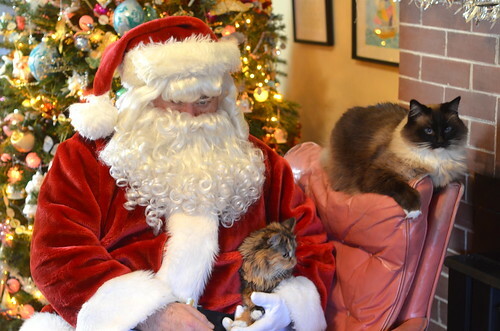 I hope they got all the treats and toys and catnip they wanted. LOVE the second to last one with Charlene looking up at Santa behind her! They are all awesome! Joyful Christmas and Peaceful New Year. Thanks for all the wonderful posts and photos this year. Your blog is my happy place. 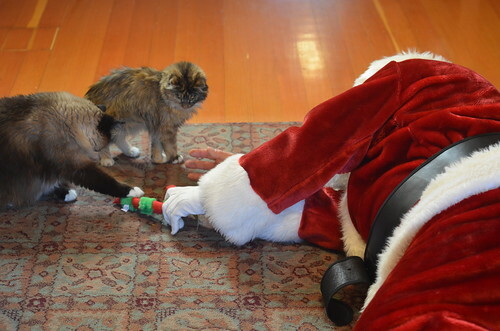 These are adorable, especially Santa on the floor with the cats. 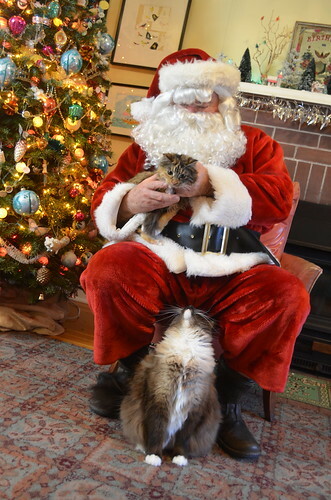 Aww, what sweet pics of the girls with Santa Pa, er, Paws. Merry Christmas Charlene and Wylla!! Adorable photos--all of them! 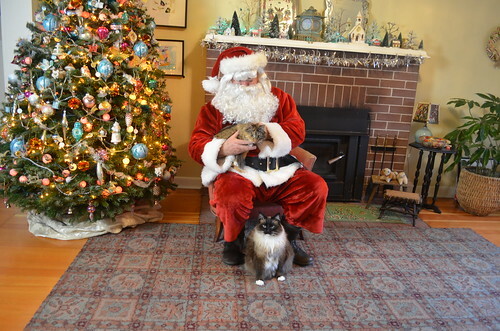 Happy holidays to everyone, and may Santa bring catnip to all of your furry cat friends. What adorable pictures! I can't decide which is my favorite, there are so many wonderful ones! In less happy news, our lovely puppy Isaac has gone to the Bridge. Many thanks to everybody here for all the good thoughts you sent his way; I know they helped him have a few more happy months with us. I'm so sorry to hear about your dog! I am so sorry to hear about Isaac's passing. This just MAKES my Christmas! 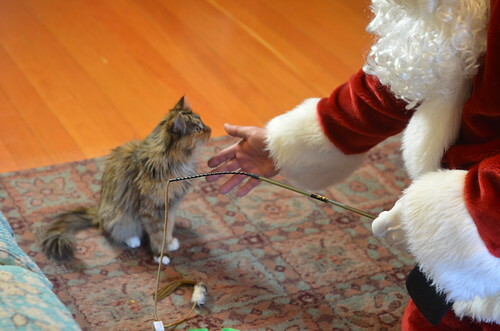 So did Wylla work up the courage to ask for a Red Ryder BB Gun? You're gonna shoot your eye out with that thing! Also, can we see a pic of her in the pink bunny suit? What? gosh, all the pictures are adorable! 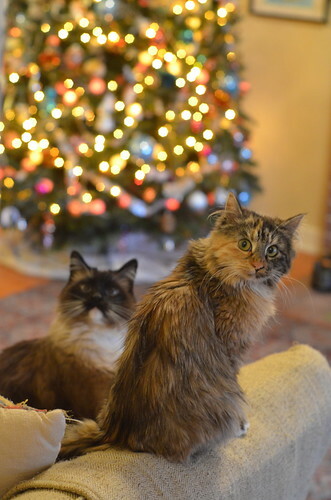 I think my favorite is the very first one posted where Wylla and Charlene are very curious and surprised looking! Wonderful post. Merry Christmas you and yours! 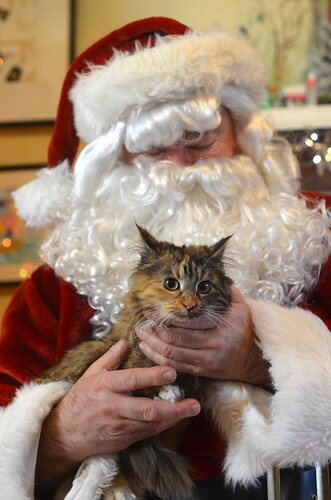 I agree with the Celestial Kitty Andrea, the shot of Charlene looking up at Santa is priceless. They are JUST like little children in their fascination (and fear) of the big man in the red suit. It's amazing really. Santa rocks!! I could feel the girls' excitement as they sat on his lap and whispered their wishes into his ear. Delightful! !